As I said before (in this post), headed to the Duthie Winter Gardens this weekend. They kids were so excited, and Joshua kept asking where we were going in order to have Darren or I explain to him about these special gardens again. To get to the gardens from our house (without walking for several miles each way), we had to take one bus downtown and transfer to a bus that runs south to the park. The Joshua and Abigail both loved the bus ride. Joshua was especially observant of all the things we were driving past in the city. This picture was taken on the bus ride home using my mobile (cell phone) because the camera battery had died. 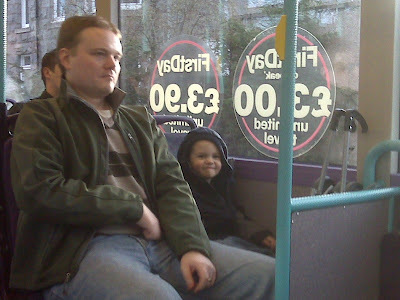 Joshua loves riding the bus. The winter gardens are just a part of this large park. We explored some of the flowers and sculptures on the way to the green houses. When the weather is a little warmer, I am looking forward to some fun trips to the park to check out all the walking paths, run through the play fields, sit in the gazebo. Joshua and Daddy had fun checking out this interesting bird bath. Spring is beginning to show, here and all over Aberdeen. I am continually amazed at the crocuses that pop up everywhere. There are even several dotting the lawn in our back garden. Innocent grassy areas are being transformed into a dramatic display of spring. While Abigail and I are standing at the edge of the crocus blossoms, Joshua has walked into the middle of the blooms. I laughed when I saw the picture below. It looks like Joshua is trying to stomp on the flowers. But in reality, after I made a passing comment about not stepping on the flowers, so he is carefully tiptoeing his way through the field so as to avoid squishing them. After several detours and some fun exploration, we finally arrived at the David Welch Winter Gardens. Joshua was so excited and ready to go inside, but we made him join me for a picture outside the entrance.